I feel very fortunate to be able to travel often and meet amazing educators across the globe. However, when I am driving in a new area, I rely on my GPS heavily to navigate me through the concrete maze of city noise. It is hard for me to imagine a time before the Maps App, especially driving alone. Imagine having to pull over to read a paper map, hope you and it are facing the same direction and trust your own directional instinct. But what about those who navigated the globe before paper maps? Trail Trees, as I have come to learn, are pieces of history, often hundreds of years old. Before paper maps, Indigenous people would bend young trees to create permanent trail markers, designing safe paths through natural brush often pointing towards food, water and other landmarks. As time progressed, these trees have grown, keeping their original shape while modern life has sprung around them. 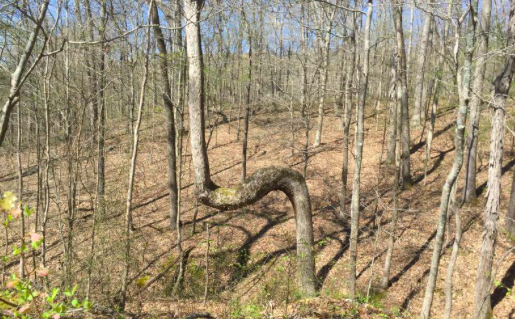 While we don’t rely on trail trees today, I imagine the stories they could tell! This post is inspired by a recent visit to Wikwemikong, Ontario, the recent passing of Gord Downie, and conversations with Indigenous people I have met in recent times as I continue to learn more about Canada’s history, residential schools and diversity. As many of you know, my body of work with Computational Thinking usually focuses on the math side of things. 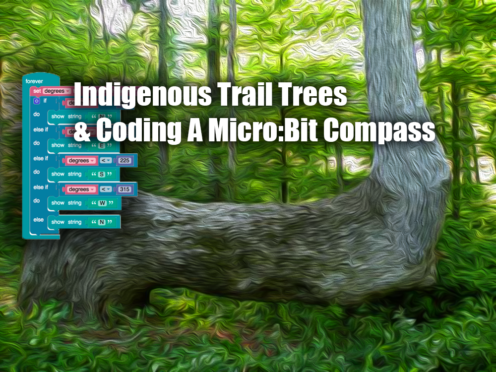 Using the Micro:Bit, students can code a navigational compass while learning about trail trees, geography, culture and Canadian heritage. The source code to program the Micro:Bit is below. 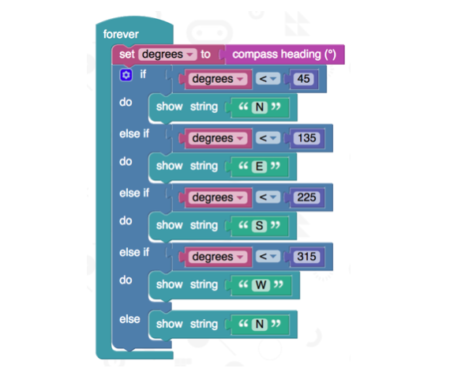 First, a forever loop keeps the degrees variable to up date by reading the internal compass heading of the Micro:Bit all the time. Put on your math caps and consider the different degree ranges. If “degrees” is between 135 and 225 the compass is pointing mostly East as shown above. The script is quick, but you can discuss conditional statements, cardinal directions, numerical ranges, trail trees, geocaching, etc. As a next step, we could talk about trying to determine the time of day using the sun, as our trail markers would have done hundreds of years ago. I would never want to be stranded alone in the bush after dark waiting to become something’s prey. Perhaps you could have students write a quick narrative about this very topic. Small moment writing often yields rich word choice and descriptive details. Since the Micro:Bit also has a temperature sensor, you can get quite creative with your activities. If I have learned anything in recent times, reconciliation begins with awareness. This post is my attempt to do just that. While there is a dark side to this awareness, having conversations is entirely crucial. On more than one occasion in recent weeks, I have been told that not talking about residential schools and Indigenous culture, out of fear or discomfort, is far worse than worrying about offending someone. 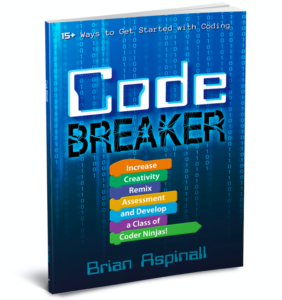 As I reflect on my journey as of late, I realize that although I went to Manitoulin to “teach” coding and math workshops, I was the true learner. I was the true learner. Feel free to try this activity with your students and comment below, I would love to continue to learn from them and you. Thank you for your story on the Native American Trail Marker Trees! Dennis Downes, author of the book Native American Trail Marker Trees; Marking Paths Through the Wilderness, has studied these trees for over 35 years. 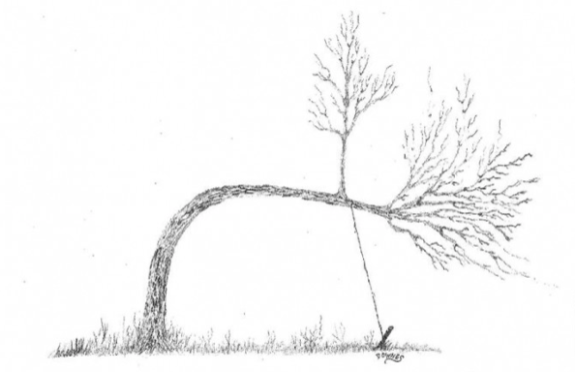 His sketch in the article is taken from his book. Downes has lectured all over the country on these historical landmarks and has been the ‘Johnny Appleseed’ or catalyst of the Trail Marker Tree movement that is underway. Many groups from around the country have now jumped on board and hopefully through all this new found attention and recognition, the Native American’s will be acknowledged and respected for their resourcefulness of using the trees for navigation and signage. The history of the Trees should not be forgotten!